Selected readings from Gerald Durrell’s classic ‘My family and other animals’. Durrell’s autobiographical work focuses on his childhood years, spent on the Greek island of Corfu. The human comedy is interspersed by descriptions of the rich ecology which Gerald observes on his expeditions around the island, and seashore. 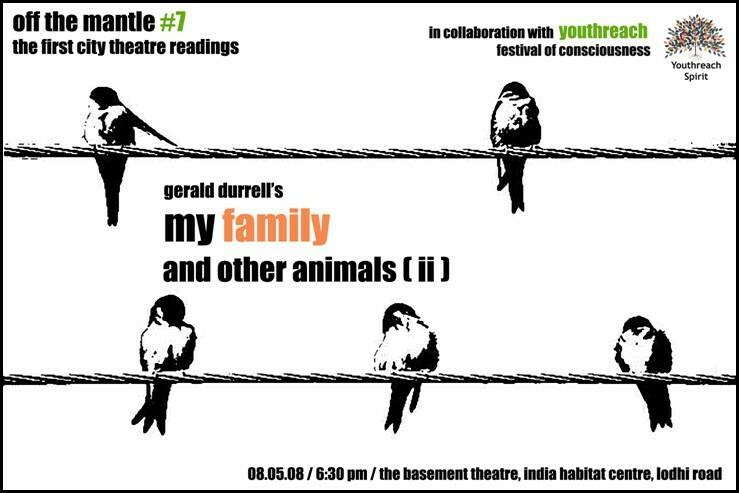 Venue: The Basement Theater, India Habitat Center, Lodhi Road. The Youthreach festival of consciousness is an exploration and celebration of human potential. The festival seeks to create processes, experiences and events that allow for a quiet unfolding and integration of the inner self. A watering of the dry places in the heart that creates a deeper order and awareness within ourselves and of the world we live in. We believe it is this inner order, this awakening, this celebration of self that makes true humanism possible. Through film, art, meditation and much else, it is an invitation to a journey that may lead to thresholds of higher states of awareness, sensitivity and consciousness.